The inaugural Waste Me Not Recycled Art Show will feature art from Brevard County K-12th grade students who submit their artwork to participate in the Recycle Art Contest. For more information, refer to the RULES section in the registration form or contact the contest coordinator, Kim Farson, at KimFarson@yahoo.com. PRIZES include gift certificates from Pizza Gallery & Grill, tickets to Brevard Zoo to see Washed Ashore exhibit, gift certificate to classes from the Art Gallery of Viera, privilege of having artwork at display at one of their partners' location and more! The inaugural Recycled Art Show is a fundraiser for Recycle Brevard/3Rs and Beyond to support and make possible creating and carrying out various community projects. Students submitting an entry will receive a FREE ticket. First parent/guardian will receive discount of 50% off regular ticket price. Tickets available at WasteMeNot.eventbrite.com or, cash sales ONLY, at Pizza Gallery & Grill in Viera. 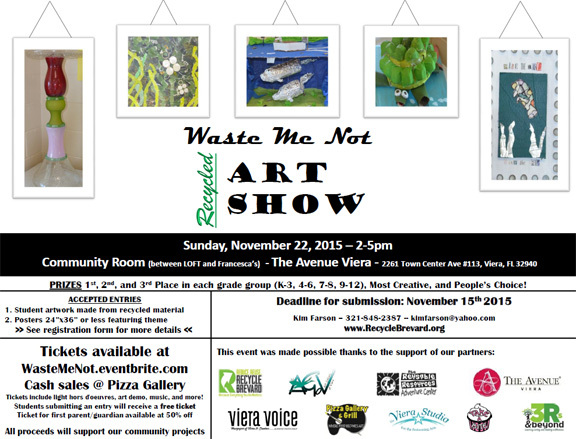 Tickets to the Waste Me Not Recycled Art Show include access to recycled art show, live demo by local artists, light hors d'oeuvres, music, recycled art hands-on activities, cash bar, and more!